Check in is from 2pm. If you consider you might be arriving sometime after 5.00pm, please contact us so that arrangements can be made for you to gain access to the house. If check in is required earlier than 2pm, please contact us to find out the availability of an earlier check in. Alternatively, to guarantee an early check-in from noon, this can be purchased as an extra for a nominal fee at the point of booking on our website. Check out is by 10am, unless your package includes a late checkout at noon. If check out is required later than 10am, please contact us to find out the availability of a later check out. Alternatively, to guarantee a late check out to noon, for a nominal fee this is able to be purchased at the point of booking on our website. Are children welcome at The Ark Stanley? Yes, we can accommodate children of all ages. Our front rooms (Anderson and Belvedere) each have a 1.5 seater lounge that folds out to a single bed to cater for an extra adult or child. Our Admiral suite upstairs can cater for an additional 2 children or adults with extra bedding available. In addition we cater for infants, with a travel cot available for inclusion in all rooms other than Weatherly. Is breakfast included in our room rate? 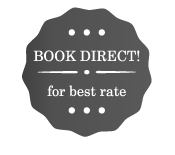 A continental breakfast is included in your room rate, along with a hot cooked breakfast for all direct bookings. When booking online, please check your booking confirmation for the details of this inclusion. Where can we have breakfast, if we don’t have breakfast at The Ark? We are a very short walk away from Moby Dicks Breakfast Bar, 5 Church Street, Stanley open from 7.30am – noon where you can always be assured of a great breakfast. I have gluten intolerance, is this catered for at breakfast? We do have a gluten free cereal on offer at breakfast, however, you may prefer to bring your own cereal or bread if you have a special preference. I am lactose intolerant, do you cater for me at breakfast? Knowing there are numerous alternatives to cow’s milk, we have found it is not always possible to cater for everyone’s differing tastes (rice/ bran/ almond/ goat’s/ lactose free milk). While we do have soy milk available, we also find most guests prefer to bring their own preference to breakfast. Are there cooking facilities in our room? It is possible to self-cater or eat a take away meal in your room, but there are no provisions for cooked meals. Each room has a fridge, kettle, coffee machine and toaster as well as crockery, cutlery, salt and pepper shakers, napkins, cheeseboard and knives, and numerous drinking glasses. There is a commercial hot plate bbq undercover on the grounds, which guests are welcome to use at any time. We have off-street parking available for up to 5 vehicles, and there is sufficient area at both the front of the house and in front of the garage for additional vehicles. We have one area available for undercover parking; if you are travelling with a soft-top, vintage/classic car or motorbike, please contact us to arrange for this area to be kept available for you. How far are you from town and the restaurants? The Ark Stanley is very central. It is a short stroll from Church Street where the majority of the cafes, shops and restaurants are located, and a 2 minute walk in the other direction to other great eateries. Can we book the entire house for a family gathering? 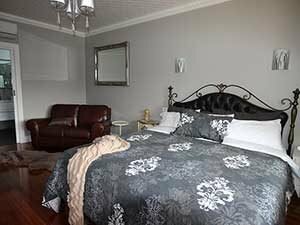 We take many such reservations and encourage you to contact us direct to discuss your requirements and length of stay so that a special rate may be organized. The washing machine and dryer in the house is available for use for a small fee. Let us know when you arrive if you need this service. Wi-fi is available throughout the property, free of charge. Can you recommend somewhere for dinner? Where ever you choose to dine in Stanley you will be assured of a great meal. During the summer months you could dine each night of the week at a different restaurant/eatery in town and not be disappointed. If you need a specific recommendation based on dietary requirements, or a special occasion, please let us know and we can point you in the right direction. I have severe allergies; I am particularly sensitive to aerosol sprays, cleaning products, candles, soaps, etc. Am I able to stay at The Ark and not be impacted on by what other guests do in their rooms? Our Weatherly Suite has its own private entrance and balcony, separate to the main house. You would be most comfortable in this suite, with its tiled floor. Prior to your arrival we would ensure candles and other scented products were removed from the room and special arrangements would be made with the preparation of cleaning to ensure no chemicals were used prior to your arrival. Which room/s has the best water view? Our Admiral Suite, situated upstairs, has the best all-round bay and sea views; you can lay in bed and see the bay from the large dormer window. From the lounge/dining area of the Admiral Suite you have great views of the bay, boat ramp and slipway. We are told by many guests who stay in our Admiral Suite that they loved getting take-away and sitting at the dining table or on the balcony, watching the sunset. Likewise our front rooms, Anderson and Belvedere, are very popular as they have large windows which look out to the bay, while our Weatherly Suite is also popular with lovely bay views and its own private balcony. Which is your most private room? The Weatherly Suite is most attractive to guests who require more privacy as there is no need to enter the house and interact with anyone else. Alternatively, our Admiral Suite is expansive and the only room at the top of the stairs, so definitely a favourite. How many steps are there to get into the house? There is one step up to the front verandah from the car park, and then one step up in through the front door. Once you are in the house there are no other steps to navigate, unless of course you have selected the upstairs room (Admiral). When you are in your room, there are also no steps up or down into your private ensuite, with the shower floor very spacious and at the same level.